Simply put, this curry is "the bomb." It's simple, delicious, easy to make and good for you. It was inspired by a similar dish my brother-in-law, Daniel, made for dinner a few weeks ago. He's a loose kind of cook -- instead of reading a recipe he relies on gut instinct. And his instincts were right on in this case! Although the recipe below calls for green beans, kabocha squash and chard since those are the things we'd received in our produce box this past week, you could just as easily substitute spinach or kale for the chard, turnips or carrots (or both) for the squash, add some potatoes, etc. Likewise, though I've listed curry powder below, you could toast your own spices if you've got the time and inclination or you could also use one of the jarred Thai curry pastes (Mae Ploy is my Thai cooking teacher's favorite brand and I agree that it's very good) with delightful results. The basic concept is very flexible so feel free to experiment. 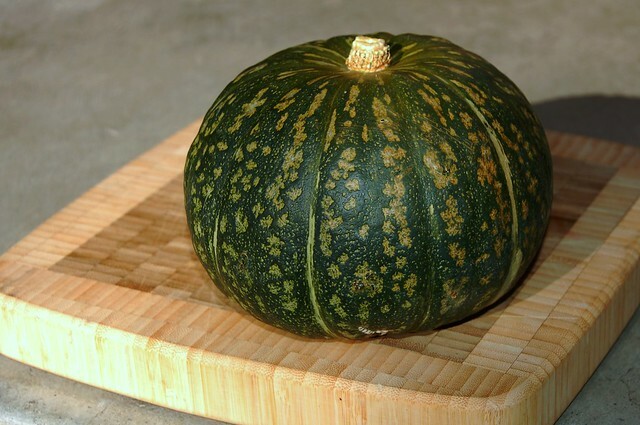 That said, the kabocha squash is truly excellent in this curry -- its dense, starchy flesh lends lots of substance and its sweet, meaty flavor complements the coconut milk nicely. Besides tasting really good, one of the nicest things about this dish is its simplicity. 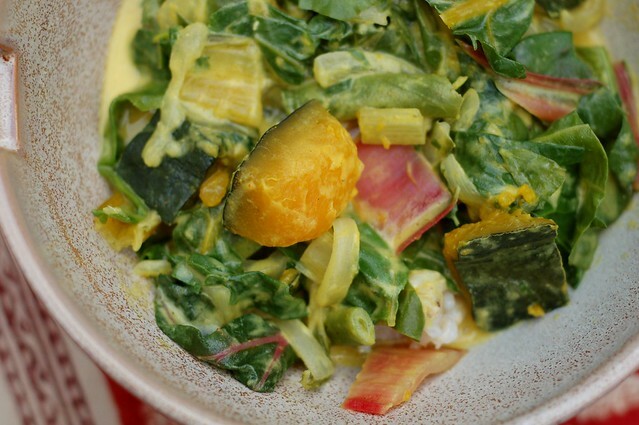 It's a great way to work a bunch of fresh veggies into a delicious meal. I'd recommend serving it with short grain brown rice and a salad. 1. 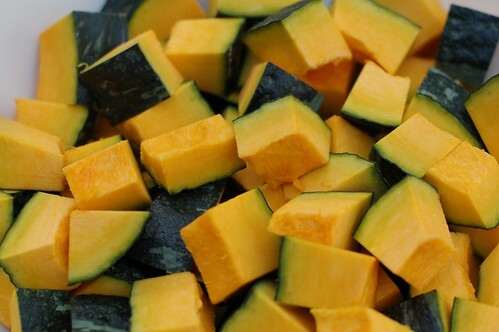 Start by prepping the veggies: Cut the squash in half, remove the seeds and then cut the flesh into 1-inch cubes (there's no need to peel kabocha squash). Wash the chard and remove the stems, chopping them into 1-inch long pieces. Cut the chard leaves into ribbons. Slice the onions and mince the garlic and ginger. Wash and chop the cilantro. 3. In a large pot, saute the onions, garlic, ginger and chili flakes in the oil or ghee for several minutes, cooking until the onions have begun to soften and become translucent. While that stuff is frying, boil the water for the vegetable bouillon and mix it well (unless you're using prepared vegetable broth). 4. 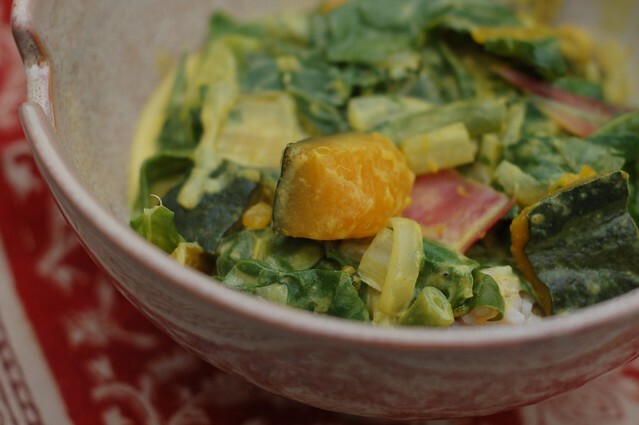 Add the vegetable broth and the coconut milk to the pot then toss in the cubed kabocha squash and season it all with curry powder, garam masala, pepper and sugar (there's most likely no need for salt since the vegetable broth should be fairly salty.) Bring to a boil then reduce the heat to medium-high and simmer for 5-10 minutes or until the squash is beginning to feel tender when poked with a fork. 5. Add the green beans and the chard stems and simmer for another 3-5 minutes or until the green beans feel done to your liking. Then toss in the ribbons of chard leaf and the cilantro and cook for another 2-3 minutes. Thanks so much for this delicious recipe! I made this dish last night for my girlfriend and she loved it. I made this last night, adding some fresh green beans as per the original recipe and using "buttercup" squash (shaped like acorn squash, tastes like butternut squash) instead of kabocha - with excellent results. Thanks for the easy, tasty recipe and all the beautiful photos on your blog!